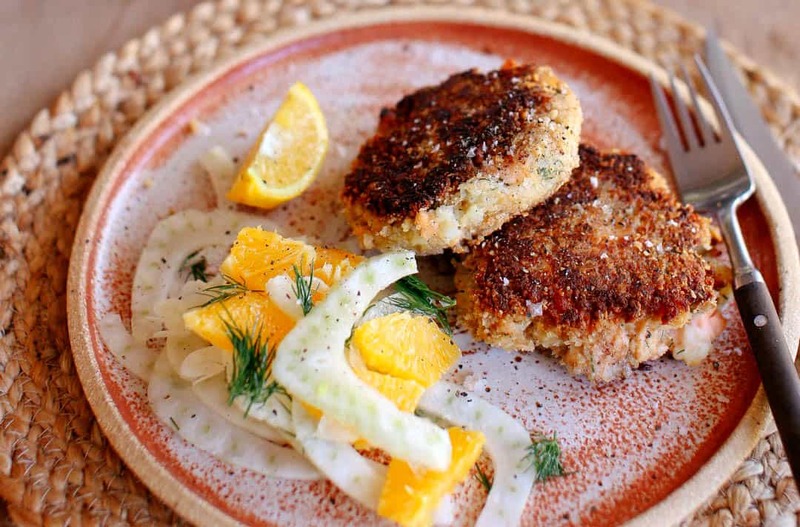 Try out this delicious twist on a staple recipe, paired with a crisp fennel salad. Combine the walnuts and oats in a food processor and blitz until fine. Add this to the breadcrumbs with the lemon zest and salt and pepper to taste. Mix together the salmon, mashed potato, one egg and two of the tbsp. of dill and form mixture into 6-8 patties. Place the flour in one large shallow bowl, combine the egg in another and the oat breadcrumb mix in one last bowl. Toss a salmon patty in the flour, then the egg then press each side into the breadcrumbs. Place on a tray and repeat with remaining patties. Cover with plastic wrap and let firm up in the fridge for at least 30 minutes. For the fennel salad, simply combine the fennel, orange, olive oil and remaining tablespoon of dill and gently mix together. Heat the butter and oil in a saucepan on medium heat. Once the butter is frothy, add three patties and cook for a few minutes on each side or until golden. Repeat with remaining patties. Serve with the fennel salad and a squeeze of lemon.